If you're a gadget geek and are interested in virtual reality, Microsoft recently announced something you should check out... HoloLens (pictured above on Reddit). There's lots of talk about whether these are really holograms (they're not) and about whether the Oculus Rift (a virtual reality or VR headset) is the future or HoloLens is. I think there's room for both... they're different... the Rift is about total immersion in an alternate reality (think gaming). HoloLens is about augmenting our own (productivity). Of course there's going to be crossover between the two and they may merge at some point - there's no reason why HoloLens couldn't do VR and VR headsets do augmented reality as well. I started watching Continuum over the weekend on Netflix and I was struck by Kiera's cybernetic HUD (read down in the Technology section) - when you miniaturize the HoloLens down to the size of contact lenses (give us 10-15 years...) we'll be able to do something very similar. 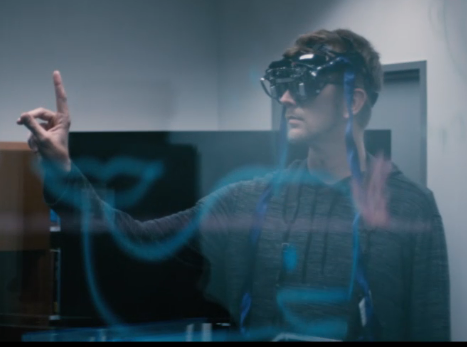 And interestingly, here's Microsoft's latest Office Productivity Future Vision video - notice the HUD - it looks a lot like HoloLens and like Kiera's cybernetic HUD doesn't it? After the Apple Watch, Virtual Reality?